The Astron RS-35A makes a distinctive “Thwap” sound when it is first turned on. 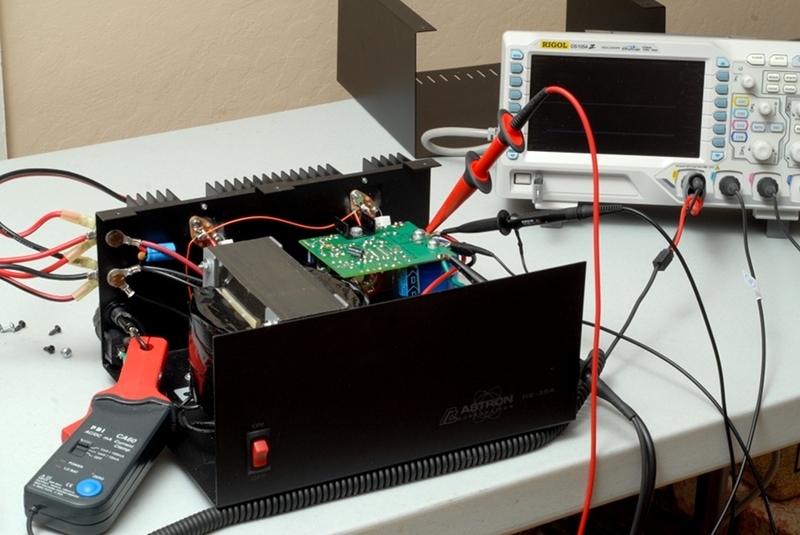 This is because there is nothing to limit the inrush of current that initially charge the main capacitor. This inrush can be hard on the power switch. 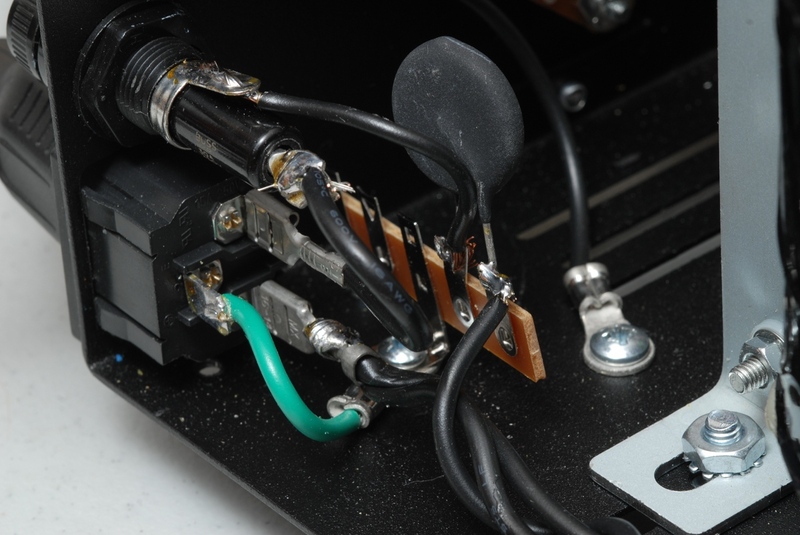 I found this article from the repeater-builder website describing how to install an inrush current limiter (ICL) to mitigate this issue. 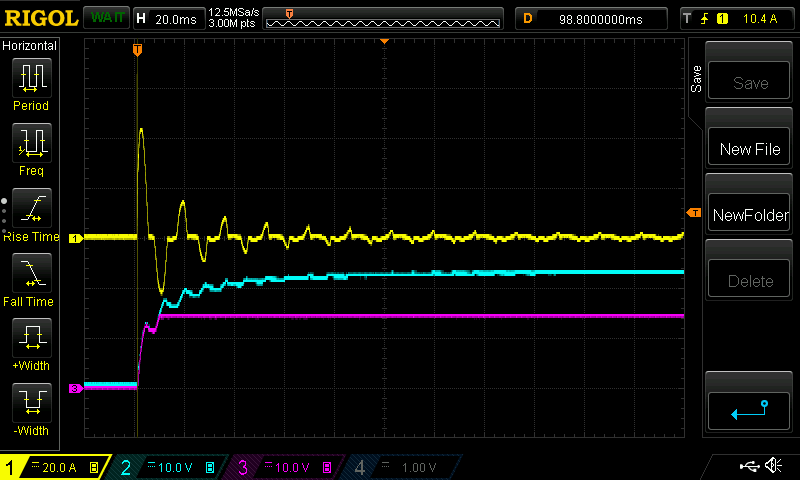 You can see that the yellow trace for the current is scaled at 20A per division. The first peak is well over two divisions, for about 44A peak inrush current. Then the next peak on the negative side is over 20A. The peaks quickly get smaller as the capacitor charges. 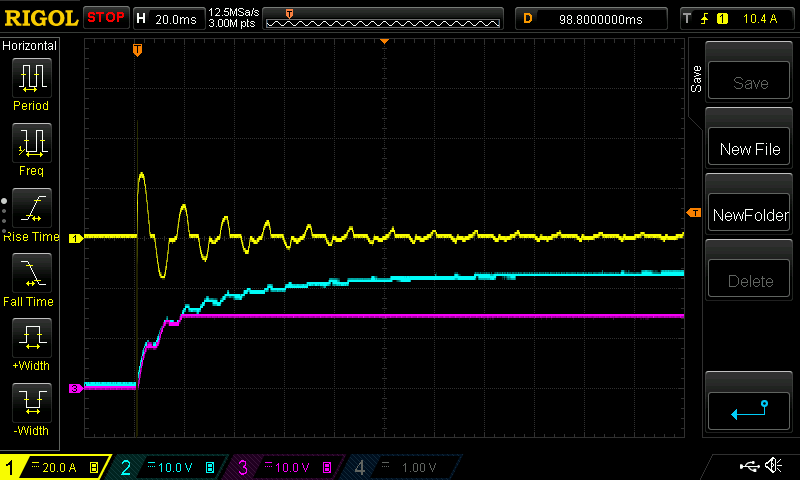 Along the bottom of the screen, you can see the cyan trace of the capacitor charging, and the purple trace of the final regulated output following the capacitor’s voltage upward until it reaches the regulated 13.8V, where it flattens out nicely. I’m measuring the current using a 60A current clamp. It uses Hall effect sensors, and has a small amplifier inside it that produces a voltage proportional to the current flowing through the clamp. To limit the inrush current, I insert a 2.5 ohm inrush limiter. I choose DigiKey part number 570-1047-ND. This is basically a resistor with a strong negative temperature coefficient, meaning that, at room temperature, it has 2.5 ohms of resistance, but as it warms up, its resistance drops dramatically, to as low as 0.03 ohms. The idea is that its initial resistance slows the inrush of current, but once things get going, it warms up enough so that its resistance doesn’t hinder the flow of current substantially. In hindsight, I probably choose one with too high a current rating. The part I chose is specified to drop its resistance to 0.03 ohms at 15A, or to 0.07 ohms at 7.5A. But the Astron’s fuse is 8A, and when it is producing its maximum output, it will draw less than the 8A fuse rating through the mains supply. By choosing a part with a 15A rating, my part may never warm up enough to get to its lowest resistance. I installed the part following the method outlined in the link above. I installed a terminal strip, and inserted the ICL device in the current path between the fuse and the transformer. Note: after I took this photo and looked at it closely, I redid the solder joints on the terminal strip, because one of them was especially light on solder. Comparing this to the one above, notice that the initial peak current is about half what it was before the ICL was installed. As a side effect, the capacitor charges more slowly, and the output voltage comes up to spec more slowly. The supply makes much less audible noise when initially turned on now, and the initial inrush is cut down significantly, so I’m guessing it will lengthen the life of the on/off switch. I’ll have to do some load testing to see if the added resistance of the ICL causes any problems with the supply’s regulation, especially in response to sudden requests for high current. But that testing will be saved for another day. Next → Next post: Heart Attack!